Listening to mostly male voices (and basses at that) delivering recitatives and monologues in Russian for four and a half hours can be enough to, well, foment a revolution. Perhaps that's why master-orchestrator Rimsky-Korsakov twice revised Mussorgsky's bland musical score to Boris Godunov, injecting color and fizz in an attempt to sustain musical interest throughout the lengthy epic drama. Until fairly recently, Rimsky-Korsakov's 1908 re-orchestration (which included an extra clarinet and trumpet) was the preferred version. Today, however, most productions have returned to Mussorgsky's own pen. 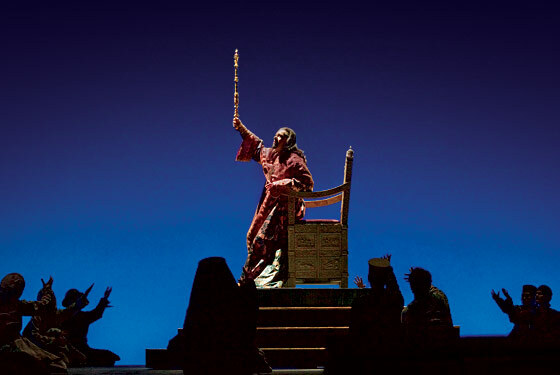 The Met in its new production uses the composer's mid-1870s revisions to his 1869 original, thus satisfying a certain curiosity with respect to the opera's musical genesis but at the same time inviting the inevitable comparisons to the Rimsky-Korsakov version. For my tastes, and taking into account some magnificent vocal efforts Saturday afternoon that included a veritable tour de force by René Pape as the title character, there's simply not enough carbonation in the Mussorgsky orchestration to last four and one-half hours without going flat. The story, by Aleksandr Pushkin, is culled from Russian history. Boris Godunov, whose ruthless ascent to power at the turn of the 17th-century was believed to have included the murder of the young heir to the throne, Czarevitch Dimitri, has regained his moral compass and now strives to govern fairly and justly. The remorseful Tsar however grows increasingly despondent over his horrific past deed, and this relentless sense of guilt slowly consumes and ultimately destroys him. Ironically, history has since cleared Boris of this crime. Pushkin pits the protagonist's crisis of conscience against the backdrop of the Russian peasantry, whose perpetual misery in a never-ending cycle of despair comes full-circle in this tale –– from the bloody, sadistic conduct at the hands of the soldiers at the opening Prologue to the hateful mob of revengeful peasants toppling the reign of Boris at the end of the opera, and ultimately to the people's blind faith in the next tyrant-to-be, Dimitri. The message of Boris Godunov is perhaps best articulated at the very end of the opera ("Flow on, bitter tears") by the Holy Fool who, although a "simpleton," is the only character capable of seeing the obvious: Those who cannot remember history are doomed to repeat it. In his voice and mannerisms, René Pape captured his character's many faces and contradictions, projecting a complicated monarch torn between his responsibilities as a ruler and the unforgivable moral lapse that had thrust him to power. When in Act 2 Pape declares, "I have achieved the highest power but there is no joy in my soul," he is at once believable as a proud but troubled man unable to come to grips with his conscience. No supertitles were needed to translate the despondent look on Pape's trodden face and weary eyes. Pape's charismatic stage presence and expressive bass, with its dark timbres and cleanly articulated high register, forged a convincing combination of power, vulnerability and pathos. He played the part of the devoted father with genuine tenderness and affection, and his touching farewell to the children in Act 4, capped by the ominous tones of the bass trombone and the tolling of the bells, was truly unforgettable. Boy soprano Jonathan Makepeace, as Feodor, delivered his second-act "Parrot Song," with buoyancy and confidence that belies his age and experience (although his voice sounded as if it might change at any moment). As Boris' emotionally fragile daughter Xenia, Jennifer Zetlan provided a convincing character on whom Boris could shower his fatherly affection, and her sweet, innocent soprano provided a most welcome timbral contrast to those of the male-dominated cast. The Holy Fool, played by a scraggly-looking Andrey Popov, pantomimes the Prologue and then rises to prominence in Act 4. Popov kept the audience guessing whether his character is a religious fanatic, a clairvoyant, a beggar or the town idiot. The only thing I knew for certain was that Popov had immersed himself thoroughly in the role. Even his exaggerated manner of singing was in-character. As the monk-historian, Pimen, Mikhail Petrenko sang in a large and commanding voice during his first-act narrative as he celebrates the near-completion of his book on the history of Russia, and his bass –– like that of Pape –– was full of nuance and expression. The boyar Shchelkalov, sung beautifully by baritone Alexy Markov, played his minor yet crucial dramatic role with style and poise. Tenor Oleg Balashov was credibly unctuous as Prince Shuisky, the not-too-loyal court advisor to Boris. Latvian tenor Aleksandrs Antonenko, as the ambitious Grigory (a.k.a. Dmitri), possesses a bold and supple voice that exudes great warmth and self-assurance. What a pity the man cannot act. The drunken monk, Varlan, played by Vladimir Ognovenko, provided some much-needed comic relief during the Inn scene, where he playfully embellishes upon the siege of Kazan under Ivan the Terrible. Ekaterina Semenchuk, as the spoiled and power-hungry object of Dimitri's affections, Marina Mnishek, looked and acted the part of the superficial Polish princess, with facial expressions (especially the movement of her eyes) that added depth to her character. Her interplay with Antonenko in their lengthy third-act duet was outstanding, although the Belarus star's rich and thickly timbred mezzo-soprano often muddies her words (which I imagined would have sounded no more intelligible to me had they been sung in English). Dressed in a full-length black coat that might just as well have had a flashing neon sign proclaiming "storm trooper," Evgeny Nikitin forged a persuasive and cunning Rangoni, the Jesuit priest who manipulates Marina into manipulating Dimitri, with the aim of strengthening the Church's grip on the new Tsar. Nikitin's small but pleasant bass was nevertheless painfully sharp in pitch for most of the third act. Director Stephen Wadsworth took the reigns at the 11th-hour from the celebrated German director, Peter Stein, after Stein withdrew from the production over visa complications. Yet while Wadsworth may have had little influence with respect to the sets and costumes (and no doubt some of the staging instructions) already in place, he managed nevertheless to mold a cohesive bond among the many characters in this work that tethered them to Pushkin's story. Set Designer Ferdinand Wögerbauer's unembellished walls and barren wood-studded stage floor, sparsely adorned with props that include a throne perched unpretentiously atop a raised platform, lent a cold and barren chill throughout the four acts that, with the help of Duane Schuler's complementary lighting techniques, mirrored the despondent mood of the oppressed Russian peasantry. The centerpiece of this set is a massive book, its pages open and clearly visible to the audience, intended to chronicle the monk Pimen's ongoing account of Russian history but more likely symbolizing the country's terrifying past. Compared with the minimalist sets, Moidele Bickel's colorful costumes stand out rather brashly –– in much the same fashion as those familiar De Beer commercials where a sparkling diamond shines kaleidoscopically against a black & white backdrop. Bickel also creates a pervasive motif of the color red (as in blood) symbolizing oppression, beginning with the red-coated soldiers as they mercilessly beat the peasants outside Novodievichy monastery in Act 1, then again in the oversized red gloves worn by devious Jesuit priest, Rangoni, in Act 3 and yet again in the all-red attire of the soon-to-be tyrant, Dimitri, later in that act. Russian conductor Valery Gergiev forged a detail-oriented rendition of the Mussorgsky score that allowed the pervasive wind writing (especially clarinets) to soar above the string textures, and kept the unusually large chorus mostly in-sync with the orchestra. Still, aside from the flamboyant Coronation Scene (Prologue) and evocative fourth-act crowd scene outside the Cathedral of St. Basil, Gergiev could do little to keep Mussorgsky's musical score from growing tiresome and predictable. The Met Orchestra, which I continue to call the finest orchestra in the world, did not disappoint. 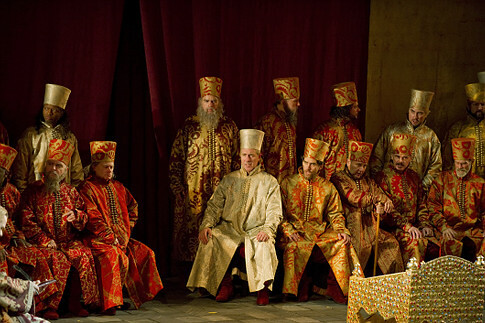 The 120-strong Met Opera Chorus of Russian peasants, boyars (noblemen) and soldiers, under the watchful eye of choirmaster Donald Palumbo, sang in good voice and navigated its way through the pernicious Russian diction with poise and confidence. As Palumbo told the worldwide broadcast audience during an intermission interview, the chorus had been preparing its parts since early August. In spite of the inevitable ensemble problems endemic to such a large body of singers with limited lines-of-sight to the conductor (e.g., problems staying with Gergiev's beat in the Prologue during the orchestra's relentless triplet figures), Saturday afternoon's effort by the chorus will nevertheless be remembered as a collective effort par excellence, one unlikely to be forgotten anytime soon.